The Cascade Conference (or Cascade Collegiate Conference) is a college athletic conference affiliated with the National Association of Intercollegiate Athletics. 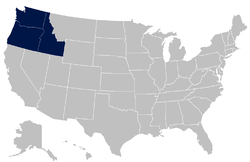 Member schools are located in the Northwestern United States. Its teams compete in NAIA Division II for basketball competition. The conference's ten members compete in 13 sports. The current commissioner of the conference is Robert Cashell. Eastern Oregon University participates in football as a member of the Frontier Conference.